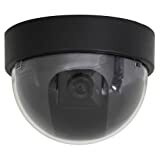 Dome Shape Red Flashing Light Gives the Appearance of a Real Working Camera Push On/Off Switch Comes with 2 Screws and 2 Drywall Anchors for Mounting. Dome Diameter: 4 1/2-Inch Requires 2AA Batteries. This is an actual surveillance camera in outdoor housing that has been modified into a-Inchdummy-Inch or fake security camera.